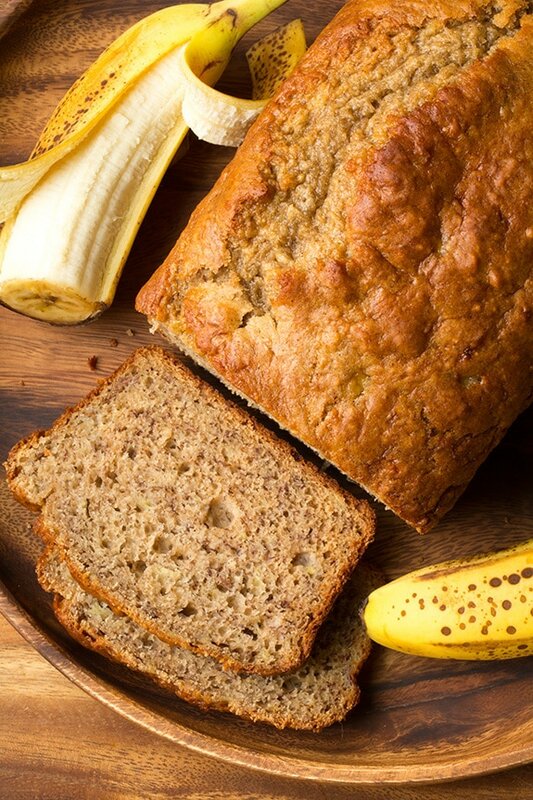 Banana bread has always been one of my favorite treats as long as I can remember. I could eat it every single day. It’s easy to make, it uses basic pantry staples that I always keep on hand, and it’s a sweet my whole family can always agree on. 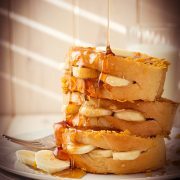 Plus it makes a great dessert to bring to any get together because who doesn’t love it? The only draw back is that more often than not it’s packed with sugar and butter, which I personally think is fine in moderation, but if you want to enjoy it more often this a great recipe to use. After adding all the nutritional info together (based on the back of my labels and Wikipedia via Google) this comes in at 139 calories per slices and only 2.3g fat, based on a 14 slices per loaf. Not bad right? To give you a comparison, a slice of Starbucks Pecan Banana Bread is 420 calories per slice with 21g of fat. 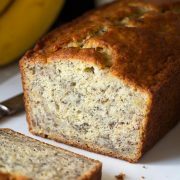 Try this one out, you’ll hardly notice much difference from this and your classic banana bread recipe. My husband said he couldn’t even tell the difference and my kids totally loved it! It’s worth trying at least because what have you got to lose, those overripe, generously speckled bananas might end up in the garbage anyway right? 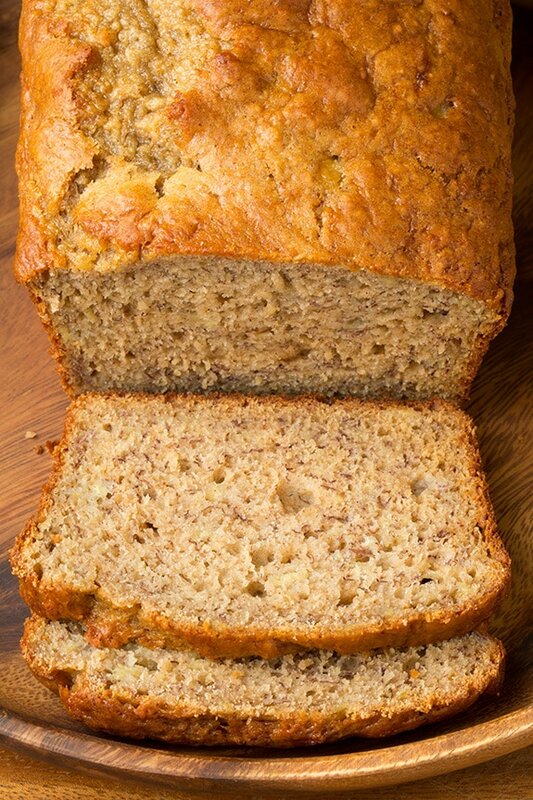 Don’t waste them and put them to good use with this delicious and moist, light banana bread! 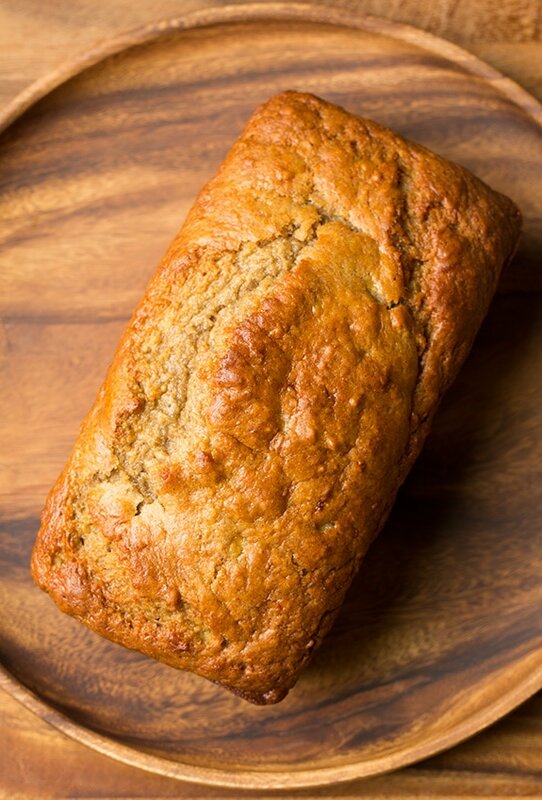 Delicious banana bread recipe made with just 2 Tbsp butter. Uses applesauce and Greek yogurt instead of a whole stick of butter yet it's still perfectly tasty! Preheat oven to 350 degrees. Spray an 8 by 4-inch loaf pan with non-stick cooking spray. In a mixing bowl whisk together flour, baking soda, cinnamon and salt for 20 seconds, set aside. In the bowl of an electric stand mixer blend together granulated sugar, brown sugar and butter until combined. Mix in applesauce then blend in eggs one at a time. Blend in mashed bananas, Greek yogurt and vanilla. With mixer set on low speed slowly add in flour mixture and mix until combined. Scrape down sides and bottom of bowl and fold batter several times to incorporate. Pour batter into prepared loaf pan. Bake in preheated oven 55 - 60 minutes until toothpick inserted into center comes out clean, and tenting loaf as needed during last 15 - 20 minutes to prevent excess browning on top of loaf. Cool in baking dish 5 minutes then remove from loaf pan and on cool on a wire rack. Store in an airtight container. 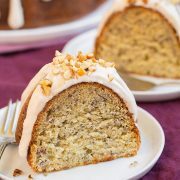 Tiffany: Just compared my family’s favorite banana bread recipe (which is passed down my from husband’s grandmother and does NOT have nuts), and I would say this recipe has about half the sugar and fat, so “Skinny” applies in my opinion. I stay away from artificial substitutes too.